CAN SHE HAVE HER ICE CREAM—AND EAT IT TOO? For disgraced IRS Special Agent Tara Holloway, nothing is sweeter than indulging in her sorrows…at all costs. Fired. Tara can’t believe it. After all she’s done for the IRS, a few too many shots fired from her weapon and suddenly she’s public enemy number one. To add insult to injury, another agent has replaced her, and a ten-million-dollar assault case is hanging over her head. So much for traveling to Tokyo with Special Agent Nick Pratt, former partner and current boyfriend. 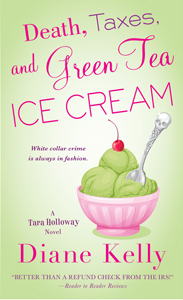 Tara’s stuck in Texas, and using green tea ice cream to soothe her disappointment, as well as the terrifying prospect of a life behind bars.